This section describes the dependency of speed on the frame of reference. selecting different frames of reference will result different speeds of the same moving object. To calculate the speed of a moving object, we need to measure the distance the object has moved within a give duration of time. To measure the distance the object has moved, we need a frame of reference. This means that selecting different frames of reference will result different speeds of the same moving object. Let's consider the following example. An archer is going to shoot two arrows to a target. The first arrow will be shot from ground and the second shot from a truck that moves towards the target. Let's assume that we have a frame of reference fixed on the ground called "x1", and another frame of reference fixed on a truck called "x2". When the archer stands on ground and shoots the first arrow, we observe that arrow flies 20 meters from A to B in frame x1 for 1 second. So the speed of the arrow is v1 = 20 m/s in frame x1 when shooting from the ground. On the truck, the arrow flies 20 meters from A to B in frame x2 for 1 second. On the ground, the arrow flies 30 meters from C to D in frame x1 for 1 second. 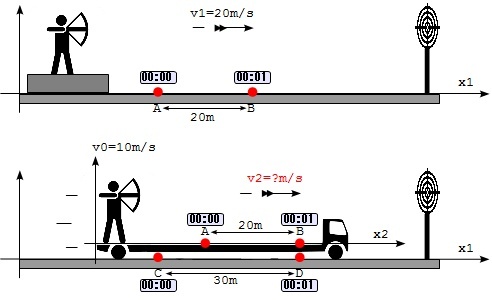 The extra distance of 10 meters comes from the moving truck. v2 = 20 m/s observed in frame x2 on the truck. v2 = 30 m/s observed in frame x1 on the ground.